Edraw infographic software lets you draw infographics offline. It doesn't take time to load symbols like the online programs. 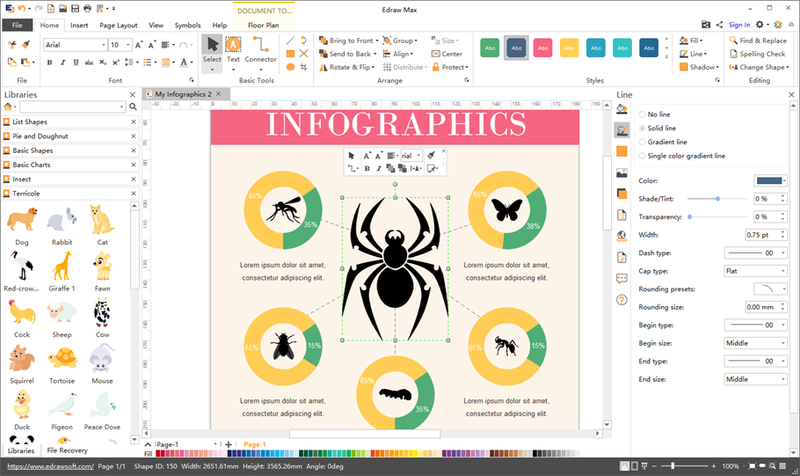 Also, it includes amazingly powerful functions for making highly personalized infographics. You can easily draw, edit, share and print infographics like professionals. Most chart elements you search from the web are static. They cannot show the exact value you need. The charts in Edraw infographic software are different. They are customizable through the "yellow handles". You can change the value by simply dragging the handles, very straightforward. It offers access to a wide variety of charts like pie chart, bar chart, line chart, spider chart, gauges chart, bubble chart, etc. Search the icons you need from the pre-defined icon library. 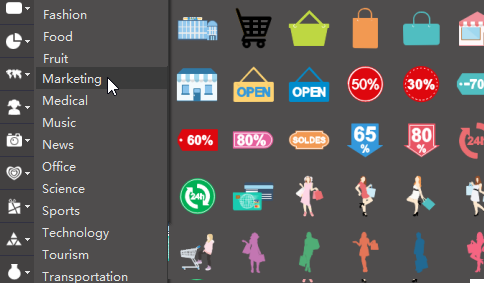 We have added 10000+ vector icons which are well categorized in groups such as basic shapes, people, maps, business,etc., and we are continuously adding more. These icons are truly editable. You can change every aspect of an icon such as fill, line, shadow, group/ungroup, etc. All the icons and elements are free to use. You don't have to spend additional money for any element in the program. 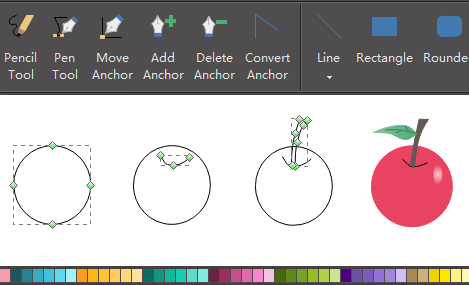 Most infographic APPs provide you with the icons (some are costly), but few of them provides you with the drawing tools. Why drawing tools are important? With them, you can draw whatever icon you want instead of wasting money to buy. Also, the powerful customizing abilities allows you to produce beautiful and high-quality infographic elements to fit all your special demands. The offline infographic software makes it easy to insert pictures and crop a picture to a certain shape. 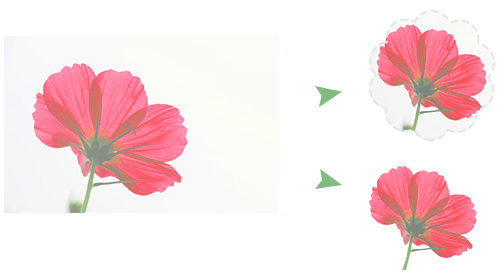 You can use the cropping tools to trim and remove unwanted parts of pictures such as the background. Use all infographic templates from the software immediately. No additional money required. 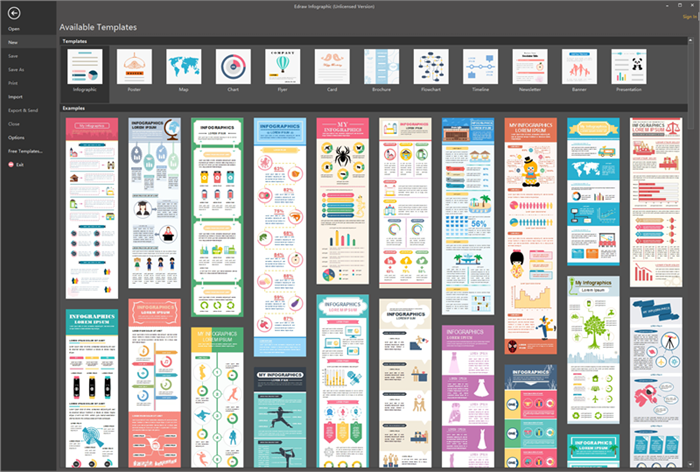 Download This Offline Infographics Software for Free!